Mining operators are saving up to 60% by choosing Kaydon replacement bearings over the OEM. Kaydon offers new replacement and remanufactured slewing bearings for hydraulic excavators, shovels, stacker reclaimers, and other large mining machinery. Kaydon replacement bearings perform as well as or better than the original OEM bearing. 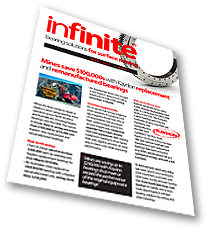 Learn more about how some of the world's largest mines are saving up to $250,000 with Kaydon, in our Infinite bearings solutions for surface mining newsletter. As capital budgets shrink, existing equipment needs to work harder than ever. Kaydon provides the ideal way to cut costs without sacrificing quality. Find out how much top US and Australian mines have saved, and learn more about the Kaydon remanufacturing program. Kaydon remanufactured bearings meet or exceed OEM specs; last as long or longer than a new bearing; and come with a one-year warranty. All this, at savings up to 60%. Find out what major mine operators have discovered first-hand and learn more about Kaydon's history of solving the world's most demanding bearing challenges. Kaydon Bearings brings decades of engineering experience and expertise to every bearing we design, build, or remanufacture. Whether it's flight-critical bearings for fighter jets and helicopters or a remanufactured slewing bearing for hydraulic excavators, Kaydon customers can count on improved performance and reliability. What's more, mine operators can save up to 60% by choosing Kaydon.